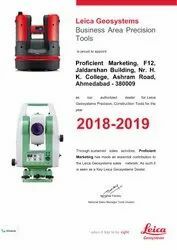 Incepted in the year 2003, at Ahmedabad, (Gujarat, India), we “Proficient Marketing” are Authorized Wholesaler Dealer of a premium quality range of Distance Meter, Rotary Laser, Total Station, Leica Automatic Level, Sokkia Automatic Level, Leica Digital Level, etc. Under the supervision of our mentor “Viral Shah (Partner)”, we are able to get the reputed position in the industry. Being one of the trusted firms in the industry, we are engaged in providing a high quality range of products. 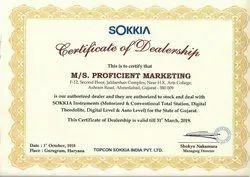 We are Authorized Dealer OF Topcon Sokkia India Pvt. Ltd. in the State of Gujarat. This Certificate Of Authority is Valid Till September 31 March,2019. We are Authorized Dealer OF Leica Geosystems Precision & Construction. 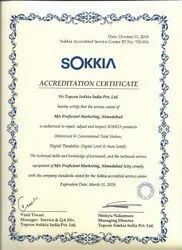 Certificate of Dealership of Sokkia .